See those five or six rows? That is all the knitting I was able to start during our two week trip out west. I totally thought I would have more time for some leisurely knitting and reading but I was quite wrong. We were just so busy with exploring and the times I wasn't the driver on our many road trips I was either doling out food to the littles in the backseat, entertaining or on rare occasions, sleeping. Anyone with multiple children on a road trip knows that the much more relaxing job is driving, right? And unfortunately, driving and knitting just don't mix, you know? So anyway, I cast on for a gift wrap romper in a Cascade Heathers wool for my newest niece who will be meeting us in the next few weeks! (Squeee!!) I think may actually try to turn it into a sweater. I also have another little hat in mind to knit up for this little October sweetie as well. Ah, so excited to meet her! I did actually finish TWO books on the trip. I finished A Little Way of Homeschooling by Suzie Andres that I was working on during the last Yarn Along. 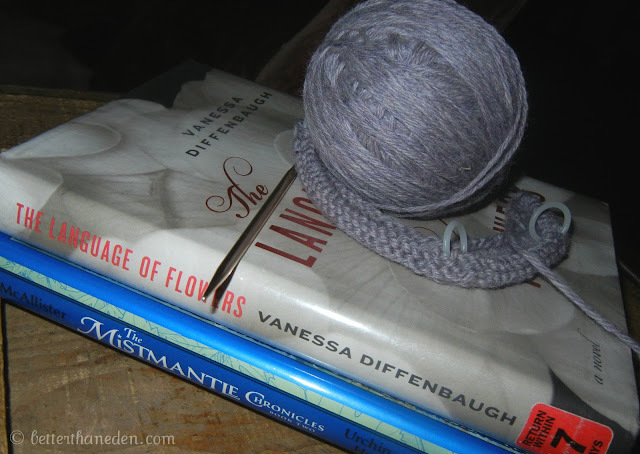 And because I needed some lighter reading as well, I ate up The Language of Flowers by Vanessa Diffenbaugh. A good book but it does have a slight melancholy to it. I do know that I now will have to make a point now to not read too much into bouquets I see (and also return it to the library before my fine gets too high :) I also began reading the second Mistmantle book Urchin and the Heartstone to the boys while we drove. I am REALLY loving our reading time together lately. It is such a joy to share a story together. 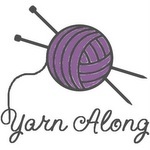 Click on over to Ginny's to see some more Yarn Along posts!